Started out with week old seedlings. About half the first planting drowned before I realized I had to provide support to the areas of the styrofoam panel that were sagging too low into the water, hence the difference in sizes, the smaller plants having been replanted a few weeks after the initial planting. The system is 4' x 8' made of 2x6 boards, half inch plywood bottom, doubled 6 mil plastic lining and a half inch styrofoam panel. The plants are in 2" net pots filled with coconut coir, sunk into 2" holes in the top. After going to all the work and expense of building this system, I found this link showing how to use cheap plastic bins to accomplish the same thing, with better results: http://www.instructables.com/id/Kratkys-non-circulating-hydroponics/ DOH! I could have had a much easier to manage setup for a fraction of the price and not a single drop of sweat or strained muscle! 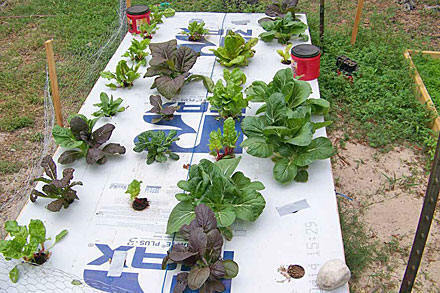 Well, hydroponics doesn't seem to be the way to go here in Central Texas. 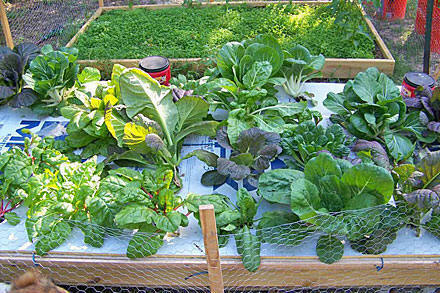 All was well until it rained, which diluted the mixture and overflowed the bed, and until the leaf cutter ants found the veggies. Since we live on 10 acres of sand, the 'cut ants' are our worst enemy. They even got into an aquaponics bed by climbing up a dangling strawberry plant.